We will install each project right the first time. Your job site will be kept neat and clean at all times. Once your project is started it is completed without delay. 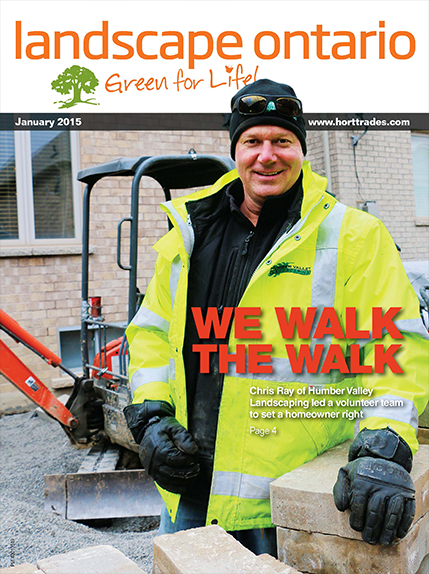 Humber Valley Landscaping Inc. is fully insured and covered by the WSIB. We begin at your house. We sit down with you and we listen. We listen to what you would like to achieve for your property. We assess your property, look at the amount of natural light and shade; we look at drainage and grading issues and the property lines. We offer suggestions, understand what your goals are for your landscape, discuss your budget and expectations, and then we get to work. A design or a concept sketch is usually required to get started. We sit down with you, present the plan, the pricing and the contract. We book a start date that works for you and we install your new landscape. Will there be a lot of disruption? We aim to minimize any disruption to your life. Our goal is to remove any stress you may have related to your project. We pride ourselves on keeping a clean, safe and accessible work site. Our customers and their neighbours are always impressed with our ability to keep the site free of debris and safety issues. If we are working on a weekend we start a little later and try to minimize noise. We will only work on weekends with your permission. We use the highest quality of materials available on the market. Many of the products we install such as Unilock and Permacon have lifetime warranties on their products. We offer a two-year warranty on installation. Plants, trees and shrubs also carry a two-year warranty. There have been instances when we have gone back to projects up to four years later for minor repairs at no cost to the homeowner. We want your business; we want to keep your business. Fairgreen Sod Farms is an established leader in the Ontario sod industry with a history of satisfying our contractor customers, sod needs. The pioneer in decorative concrete products for masonry and landscaping projects. Looking to hire a Landscaper you can trust? The quality of our work is proven & the results will WOW you! Yes, I want to receive emails about services from Humber Valley Landscaping Inc. Sign me up! (You can unsubscribe at any time).